(Bloomberg) -- Ford Motor Co., projecting losses of more than $1 billion in Europe this year, is examining the competitiveness of its vehicle lineup and brand in the region as it draws up a turnaround plan. "Our results in the last 12 months in Europe are not acceptable and we need to address that situation," Stuart Rowley, Ford's controller, said Tuesday at a JPMorgan Chase & Co. auto conference in New York. "We are looking at our plan and will address all aspects of our business, looking at our structural costs, our product portfolio and our brand." Analysts such as Morgan Stanley's Adam Jonas have been suggesting that Ford close one or more factories in Europe. The automaker is using just 63 percent of its production capacity in the region, according to Morgan Stanley. Ford's second-quarter net income fell 57 percent to $1.04 billion as operating losses in Europe widened to $404 million. "Cost alone cannot get us to where we need to be," Rowley said. "Look at our North American business, that's a good guide. We continued to invest in our product plan." The economic crisis in Europe is denting the revival CEO Alan Mulally has engineered at Ford. The automaker last month lowered its outlook for full-year profit, saying it no longer expected to equal last year's pretax operating profit of $8.8 billion. The economy in Europe, which accounts for about a quarter of Ford's revenue, is worse than the company anticipated at the start of 2012 and will stay challenging for at least five more years, Chief Financial Officer Bob Shanks has said. Ford is not cutting prices in Europe as aggressively as others, Rowley said. "There's a lot of discounting," he said. "We think it's very important to focus on maintaining margins as we address our issues in Europe." 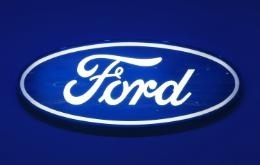 Ford rose 0.4 percent to $9.44 at the close in New York. The shares have fallen 12 percent this year. The company's European sales fell 10 percent in the first half, while industrywide deliveries dropped 6.3 percent. The challenges in Europe, where industry sales have fallen 22 percent since 2007, aren't simply the result of a cyclical, recessionary decline, Rowley said. The cost structure of the European auto industry, which includes factory capacity, is to blame for the crisis all carmakers face there, he said. "We view the issues to be more structural and we need to consider our plans in that context and we'll develop them accordingly," Rowley said. "We certainly don't think muddling along will work." In North America, where Ford generates most of its sales and profit, second-quarter pretax operating income rose to $2.01 billion, from $1.9 billion last year. The company said North American operating margin was 10.2 percent. Ford has more debt than General Motors Co. and Chrysler Group LLC because it borrowed $23.4 billion in late 2006 and avoided the bailouts and bankruptcies that befell the predecessors of those competitors in 2009. Ford put up all major assets as collateral, including its blue oval logo. Ford recovered those assets May 22 when Moody's Investors Service became the second major rating company, after Fitch Ratings, to raise the automaker to investment grade. Standard & Poor's, which rates Ford one step below that level, raised its outlook on the automaker Aug. 10 to "positive" from "stable."